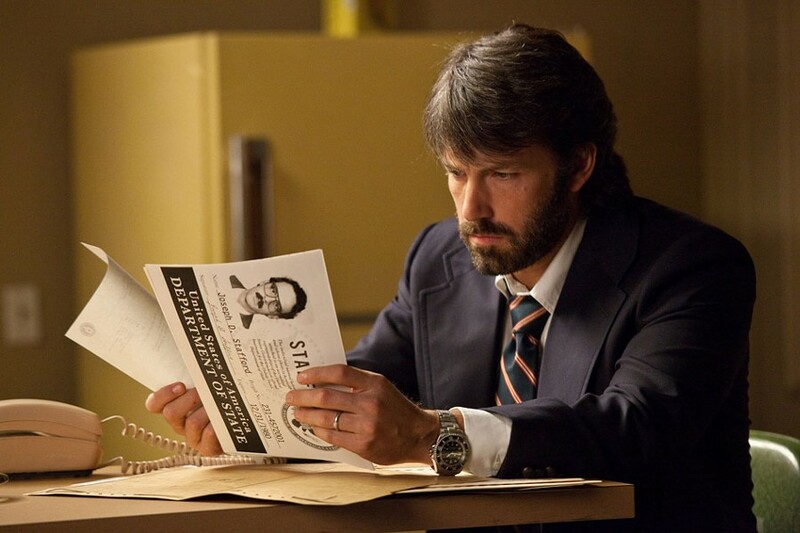 PHOTO COURTESY WARNER BROS. PICTURES Ben Affleck in "Argo." The Iranian hostage crisis of 1979-1981, which some readers may remember, did more than inflation, gasoline prices, or Ronald Reagan to sink Jimmy Carter's presidency. Every night on ABC TV Ted Koppel would solemnly intone the number of days the captured diplomats remained in the hands of the revolutionaries. The incident also spawned Reagan's infamous swap of arms with Iranian terrorists, the resurgence of Islamic fundamentalism in the Middle East, and led in a circuitous path to the invasion of Iraq, a nation the Republican administration had previously supported in its war with Iran. As Ben Affleck's new film "Argo" demonstrates, one of the stories behind the headlines suggests a moment of triumph in the midst of that crisis. Based on previously classified information, the movie tells the remarkable true story of the rescue of six American diplomats who had escaped the shocking attack on the embassy and taken refuge in the home of the Canadian ambassador. Affleck plays Tony Mendez, a CIA agent who specializes in the extraction of endangered personnel from difficult situations in foreign lands. When nobody in the agency can devise anything resembling a possible rescue, he suggests an ingenious plan: that he pose as the Canadian producer of a science-fiction movie to be partially shot in Iran. He proposes to create false identities for the six diplomats as members of the film crew — a location scout, a screenwriter, a cameraman, a director, etc. He enlists John Chambers (John Goodman), a Hollywood makeup artist specializing in monsters who has worked on disguises with him in the past, and Lester Siegel (Alan Arkin), a veteran producer; the trio sets about the process of pretending to make a picture titled "Argo." Siegel insists, as he says, that if he is going to make a fake movie, it's going to be a fake hit, so they arrange publicity, the usual stories in the showbiz papers, a reading of the script in full costume for the press, posters, business cards, and so on. The whole charade provides back story and context for deceiving the wary, bloodthirsty Iranian authorities. The central story of the intricate rescue mission provides some fascinating insight into the methods of the CIA, which for a change looks more like the good guys than usual. Inside that story, the picture shows another in glimpses of the life of the six hidden diplomats, living an odd existence, enjoying good food and drink, courtesy of the Canadian ambassador, but also frightened of the possibility of discovery, capture, and in the honored Middle Eastern fashion, beheading. While Tony Mendez works feverishly on the cover story, false identities, forging passports and visas, and instructing the six on their new names, backgrounds, professions, and so on, the film also mixes a good deal of humor in its serious situation. Alan Arkin's terrific performance as the irascible, cynical, self-mocking Lester Siegel accounts for most of the fun, with some assistance from the equally terrific John Goodman; their acting contrasts sharply with Ben Affleck's understated intensity. From its beginning "Argo" signals its participation in the peculiar genre of movies about making movies, showing the history of modern Iran — including the sinister work of the CIA in destabilizing a democratically elected leader and installing the corrupt and tyrannical Shah — in a wonderful mixture of storyboards, historical newsreel footage, contemporary television coverage, and fictional film. Its satirical portrait of Hollywood thus meshes nicely with its imaginative technique. In addition to its deft handling of a number of subjects, "Argo" accomplishes something really special. Although we know how it all turns out, the movie still generates as much suspense as any fictional thriller, showing a good deal of the tension and excitement of an important moment in contemporary history. It may even instruct a new generation in some of the realities of American policy in the Middle East and some of the reasons for the antipathy of its people to this country. Aside from emphasizing the development of Ben Affleck's career from a handsome, virile, and, frankly, mediocre actor to a competent performer and a really good director, "Argo" demonstrates the truth of Mark Twain's pronouncement that life is stranger than fiction, because life has no obligation to be probable.